One little girl dreams of being a star. But whether it's finding Mum's lost wedding ring or winning the fancy-dress prize, her big sister always shines brighter. 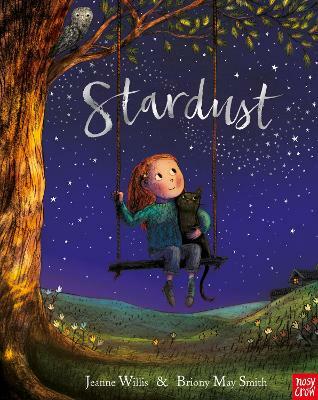 Yet for her grandad she is a star and, as he dries her eyes and they both gaze up at the night sky, he tells a story, ... read full description below. Jeanne Willis wrote her first book when she was five - a slim volume about cats written in pencil and stitched together with a painfully blunt needle so that it looked like a 'real' book. After that, there was no turning back. Having been fired from her Saturday job selling cowboy boots in the Kings Road for chewing gum, and after a brief career as a reptile vet's assistant, she worked as a copywriter and had her first picture book published at the age of 21 (which she wrote whilst pretending to be busy creating adverts for cognac). She has since written over 300 books and has won several awards which are arranged in the attic where she works. Briony May Smith grew up in Sandhurst in Berkshire, playing in the garden with her younger brother and sister. She studied Illustration at Falmouth University and was Highly Commended for the Macmillan Children's book prize in 2013 and 2014. She now lives in Devon, where her work day mainly consists of drawing fairies, interrupted only when her dog, Finbar, demands it's time for his walk. Briony's work is inspired by fairy tales and folklore and life in the country.